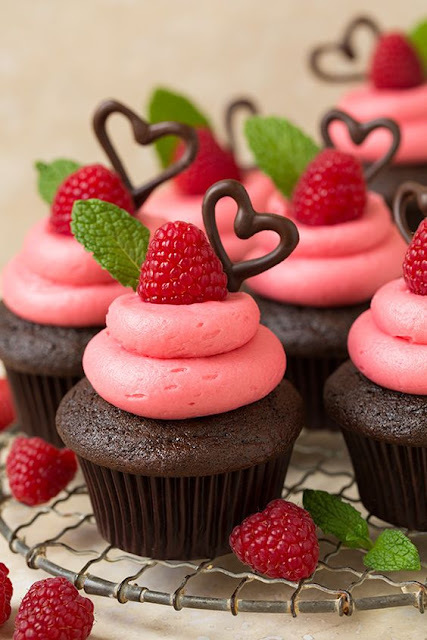 Indulge your chocolate craving with these dark chocolate cupcakes topped with rich and creamy semi-sweet raspberry frosting.. I made this for my husband's birthday. It was AMAZING! I'm not an expert cook by any stretch of the imagination, but the recipe was really easy to follow and it turned out well. I made a cake instead of cupcakes and didn't wait for the icing to set...we were too anxious to eat it...and it has been tasty, moist, and held together well. I also made the cake last night and covered with a towel to cool...it didn't dry out. The frosting seemed like it wouldn't be enough since I wanted to pipe it, so I added confectioner's sugar. I kept adding more and more (1/2 a big bag) to get it to a decent consistency. Then I had too much of course. If you are tempted to try this, go for it! When reading the negative reviews, you can see the people that had issues with their cakes didn't follow directions. If you use the ingredients they tell you to use (we used store brand), then you shouldn't have a problem. Very worth it and we will definitely be making it again!!! The end result, the most delicious raspberry icing I have EVER made. It piped out beautifully on the the horrid looking cupcakes. The taste was rich and chocolaty and not too sweet:) I'm still searching for that perfect from scratch chocolate cupcake recipe, but this frosting is the best!